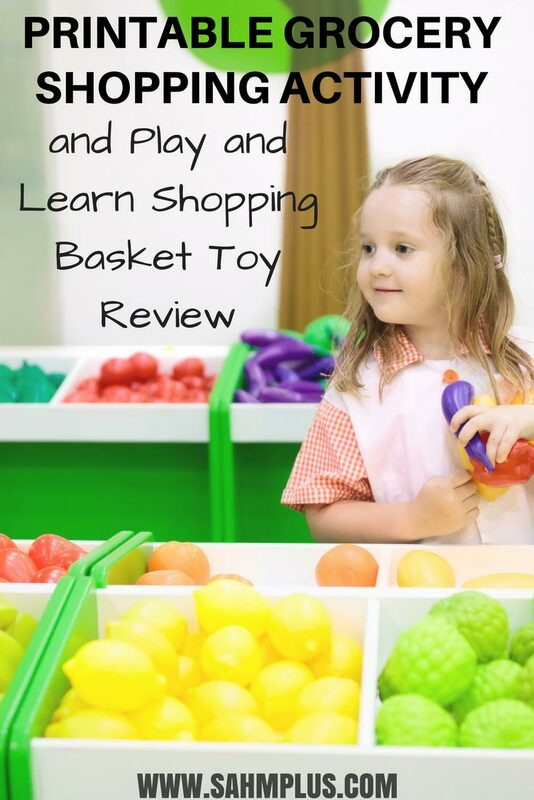 A play and learning shopping basket toy review in partnership with The Learning Journey and Tomoson. As you probably already know, it’s important for children to engage in pretend play. Generally, I try to stick to toys that educate as well as entertain vs fluff toys. I want my children to have fun while gaining some sort of knowledge about the world we live in and how to interact. The Play and Learn Shopping Basket Toy offers plenty of open-ended play from grocery shopping to cooking in the kitchen. I also found that it was easy to boost the educational opportunities with this toy by creating a few activities that won’t take more than a few minutes of your time. I received a Play and Learn Shopping Basket from The Learning Journey International and Tomoson in exchange for the following review. 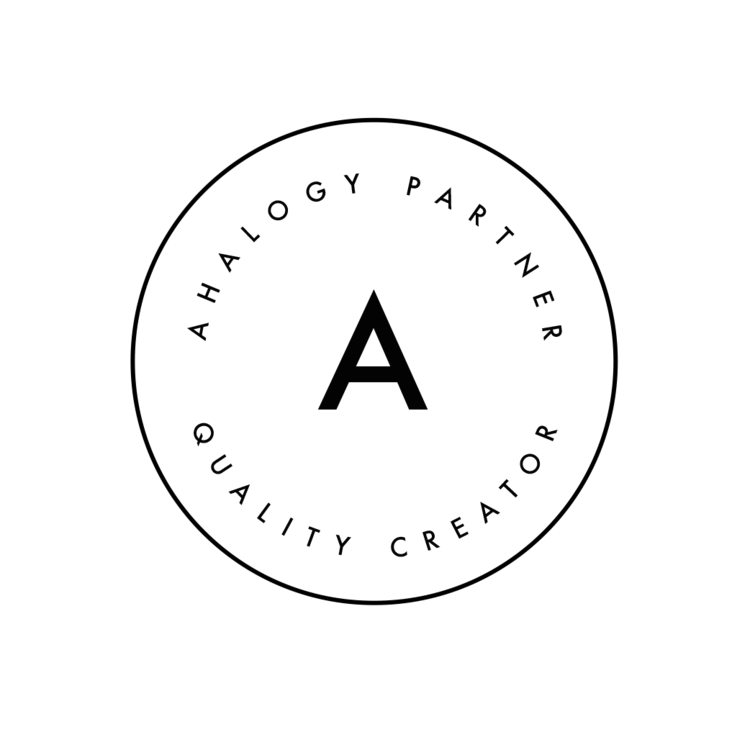 No other compensation was provided and all opinions expressed in this post are my own. 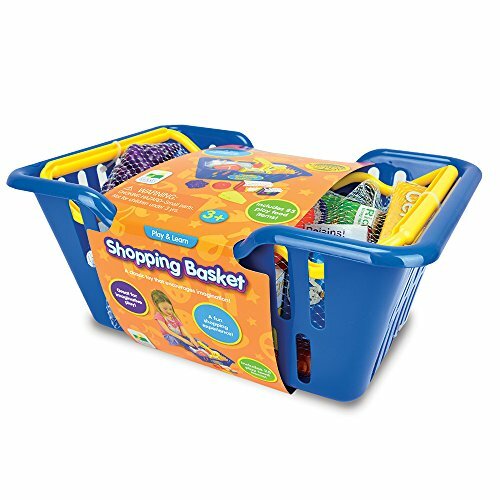 The toy shopping basket is recommended for ages 3 and up, and is a great learning toy for your little ones. 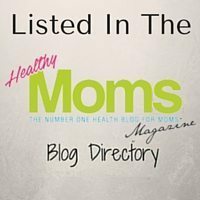 I’m excited to share this Play and Learn Shopping Basket Toy review with you! 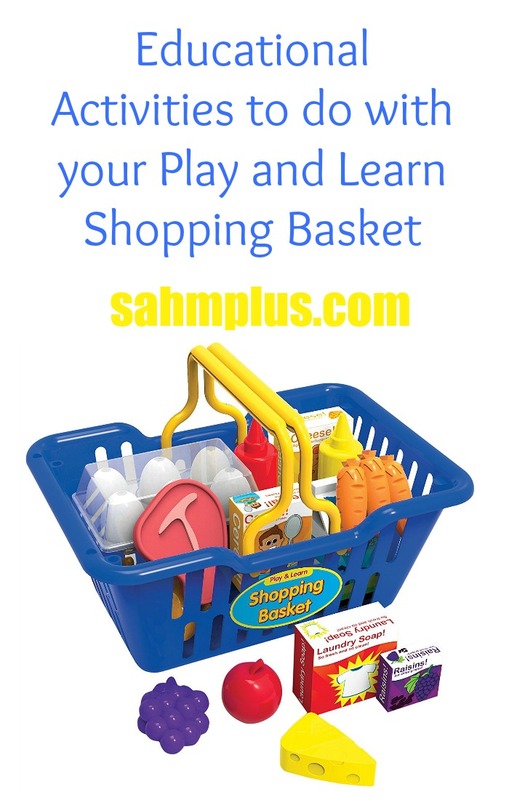 For starters, the Play and Learn Shopping Basket is suited for ages 3 and older. The plastic shopping basket is neutral colored, which makes it perfect for all kids. And, it comes with 24 cardboard and plastic food accessories to complete the educational shopping experience. One activity we worked on was creating and following a list. To help enhance my daughter’s ability to follow instruction, I created a couple grocery shopping lists. I simply found photos of items to shop for and printed them on paper. 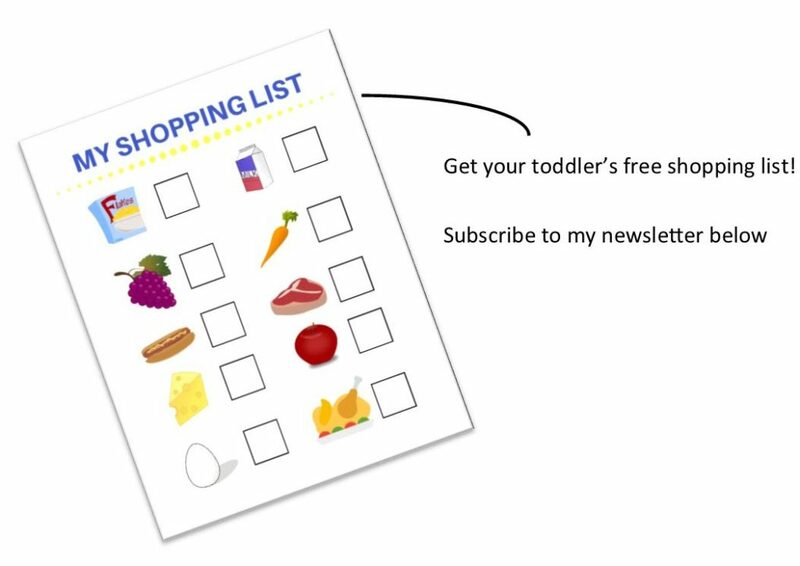 If you love this idea, I’ve created a shopping list for your toddler too!! Another great activity we did was to grab a few items and discuss what “recipes” we might make with them. I’m fond of the large size and durable construction, compared to some other plastic shopping toys we’ve used. This basket, plastic food, and cardboard items actually feel like they could stand up to more normal play. One thing that bothers me is the strange size proportions between the foods. 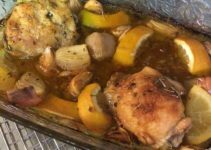 Am I the only one that thinks it’s strange that a whole chicken is the size of 4 eggs? Or that a hot dog is bigger than a carrot? I know kids don’t mind, but I wish there were a bit more even scaling system that didn’t make things look so ridiculous. Aside from my dislike for the odd proportions, I was pleased that my daughter began using this set for nearly every food-related activity. She was taking it upstairs during quiet time as well as playing with it regularly, and feeding her baby doll at picnics. She seemed to really enjoy the toy. I feel like the basket itself was appropriately sized. I also loved that it was gender neutral, because I see no reason in making shopping toys pink. You can purchase your The Learning Journey Play and Learn Shopping Basket on Amazon. What did you think of the Play and Learn Shopping Basket Toy review? Do you have any questions about the toy? What a great idea! I use to love to play store with my kids when they were little. Wish I had this then!! This is one great toy to give to my godchild! Seeing this makes me miss my childhood days, anyways, thanks for sharing this! Must buy this toy soon. Hello Ivy, it’s very important to give knowledge to children while they are having fun with toys. However, I like your idea of Play and Learn Shopping Basket for boosting the education opportunities of children. Thanks for sharing.